Conceptually, density is best described as the compactness of a material. That is to say that dense materials contain a large amount of material in a small amount of space. Less dense materials have a smaller concentration of mass in a given volume, or a mass spread out over a large volume of space. Gases are not particularly dense because of the large amounts of empty space between particles. Even a very large mass of gas (e.g. the atmosphere) is spread out over such a large volume that its overall density is small. Mathematically, density is expressed as a ratio of mass to volume. It is a characteristic quantity, that is the density value is unique for every substance. Graphically, density is the slope of a graph of mass vs. volume. Slope is defined as a ratio of the change in y to the change in x and since the y-axis displays mass and the x-axis volume, the slope is a ratio of the change in mass to change in volume, or density. Intensive properties are those that do not change regardless of the quantity of the sample. 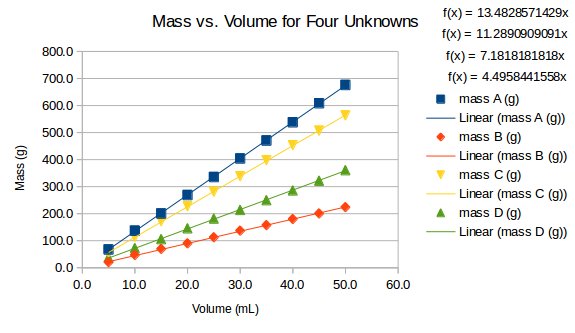 Mass and volume, the quantities used to determine density are extensive properties because they are dependent on (and change) with the quantity of sample. Since density is a ratio of mass to volume, it remains constant for a substance. This, coupled with the ease with which density can be found, makes it a great property to use to identify a substance. A block with a mass of 253.5 g has dimensions of 2.14 cm by 5.39 cm by 4.88 cm. Find the density of the block. A sphere with a diameter of 5.86 cm has a mass of 178.96 g. What is the density of the sphere? The volume of a sphere can be found from the formula V = 4πr3, where r is the radius of the sphere. The given diameter is 5.86 cm, and since diamater is twice the radius, the radius must be 2.93 cm. Using this radius and the aforementioned formula for volume, the sphere's volume is found to be 316 cm3. The density is then found by dividing the mass (178.96 g) by its volume (316 cm3), or 0.566 g/cm3. A 78.19 g rock is placed into a graduated cylinder filled with 50.0 mL of water. When the rock is submerged, the water level rises to 56.8 mL. What is the density of the rock? The key to this problem is realizing that the increase in the water level is due to the addition of the rock. In fact, the increase in volume of water is exactly equal to the volume of the rock. In other words, the rock displaces a volume of water equal to itself. Subtracting the initial volume of water from the final volume of water (56.8 - 50.0) gives the volume of the rock, 6.8 mL. Now the density formula from before can be utilized to find the density of the object. Dividing 78.19 g by 6.8 mL yields a density for the rock equal to 11 g/mL. In this formula, P represents the pressure of the liquid, measured in pascals (Pa). The variable h represents the height of the liquid, in meters. Acceleration due to gravity, a value of 9.80 m/s2 on Earth, is represented with the variable g. Finally, the density of the object can be found by solving for d. Realize that the units will be different from those discussed earlier. In this formula, d will be found in kg/m3. The equations for each line are displayed on the graph, from top (A) to bottom (D). A table of density values can be used to identify possible identities for each substance. A matches mercury, B matches lead, C matches zinc, and lastly D matches titanium.